The creative process has always been an important part of my life. Here I share some basics to help you along the road to creativity. 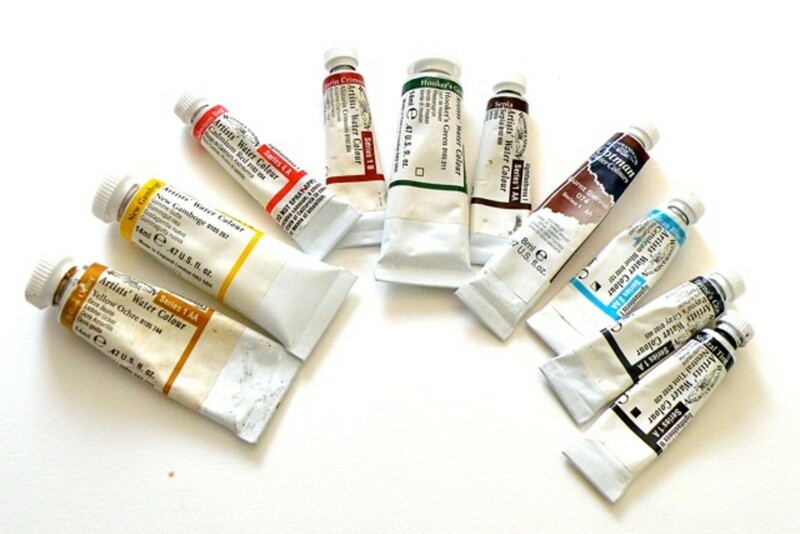 What supplies do I need to watercolor paint? 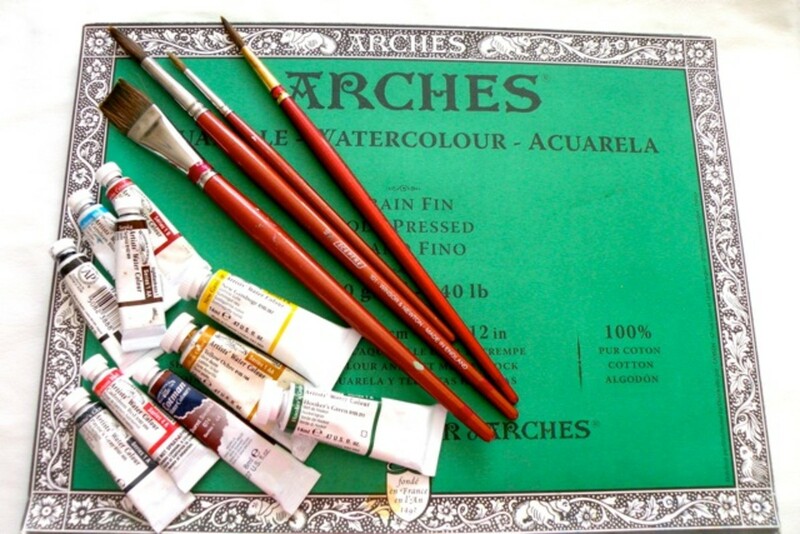 How do I use the brushes, paints, and other materials when I start watercolor painting? What techniques do I need to know in order to understand to get the look and textures that I want in a painting? 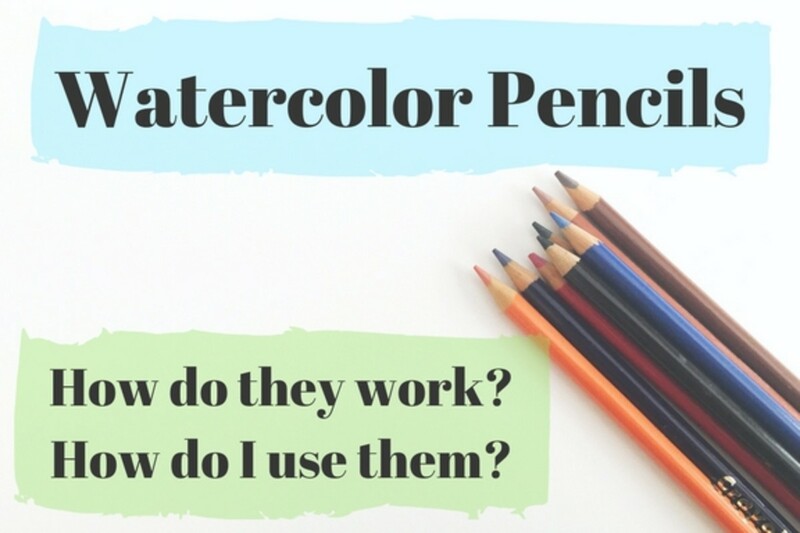 How do I use watercolor pencils? Can I use acrylic paint to watercolor? What Do I Need to Start Watercolor Painting? What Watercolor Paper Should I Choose? Good paper is expensive, but it will make a difference. Get at least 140 lb weight paper in a watercolor block or single sheets. Look for 100% cotton, acid-free paper. You can use less expensive paper for your practice, but you'll find that every painting looks better on fine quality paper. I like Arches or Windsor Newton 140 lb. or 300 lb. cold press watercolor blocks. Some watercolorists prefer hot press paper because it is smoother. It's a matter of preference. 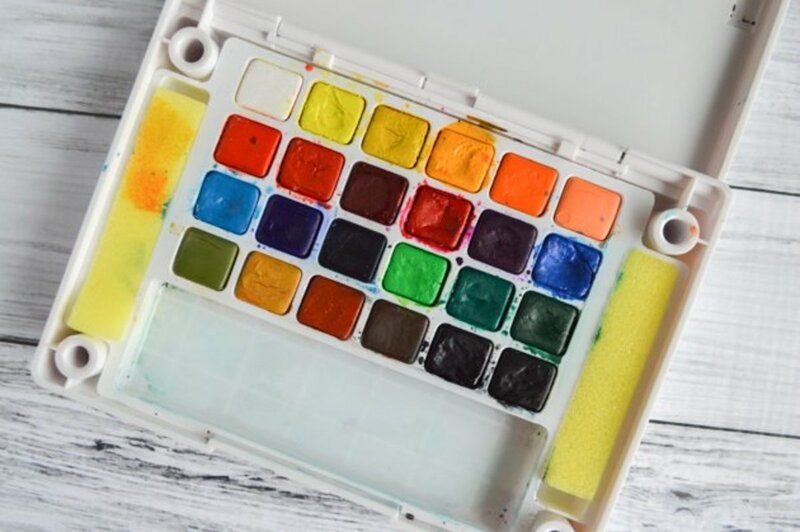 You can use a large, plain white dinner plate to start out or purchase a white plastic palette with at least six or eight wells and a flat place to mix your paints. Later, you may want to invest in a covered plastic palette, as it will be easier to protect your paints from dust and reuse them. 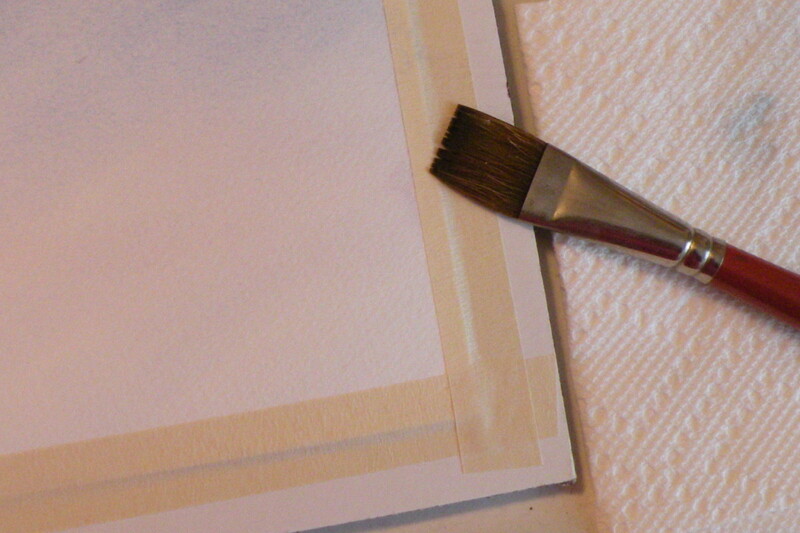 Fold up a cloth or some white paper towels to keep near your palette to blot excess water or paint off your brush. What Watercolor Paints Should I Start With? The watercolor paint available on the market is mostly comprised of two main ingredients: finely ground pigment and gum arabic. The pigment gives the paint its color. The gum arabic acts as a binder and is used because it dissolves quickly in water. The water dissolves the paint, allowing the brush to pick up the colored pigments and place them on the paper. 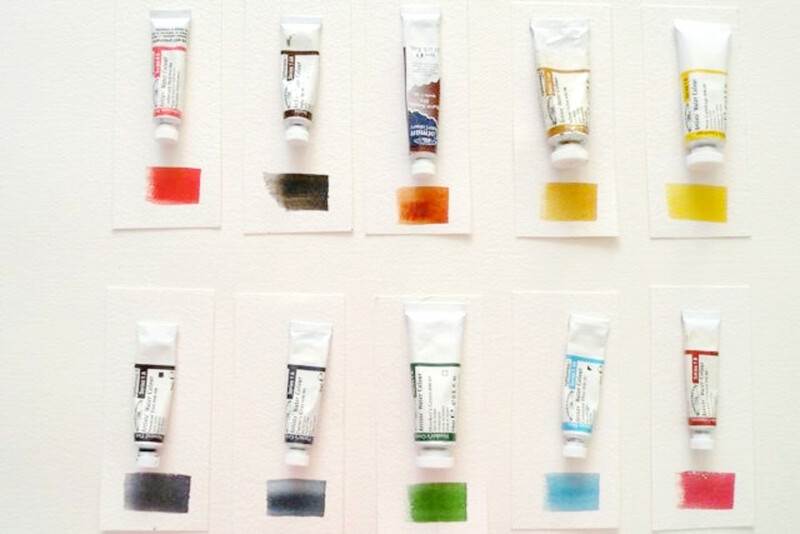 What is the best watercolor paint? The answer isn't a hard and fast one. Here are a few factors you want to consider. Paint Colors: Different brands offer their own colors, and there's no real right or wrong way to approach what colors you purchase. It's up to you to decide what you want to add to your collection, so consider what you want to pursue painting. If it's florals, you'll likely need a variety of greens, pinks, purples, reds, and other colors that help you capture the intricacies of each flower. If you want to paint beach scenes, you'll definitely need a variety of yellows, blues, greens, and grays to capture the ocean waves' movements. Permanence: This factor judges a paint's ability to keep from fading or deteriorating in quality when exposed to humidity and light. Artist quality paints will last a lot longer than student quality paints, but they're the more expensive option. Think about what you're creating, your skill level, and if you want to keep what you're painting for years to come. Paint Quality: You'll find two different types of paints: artists' quality and students' quality. 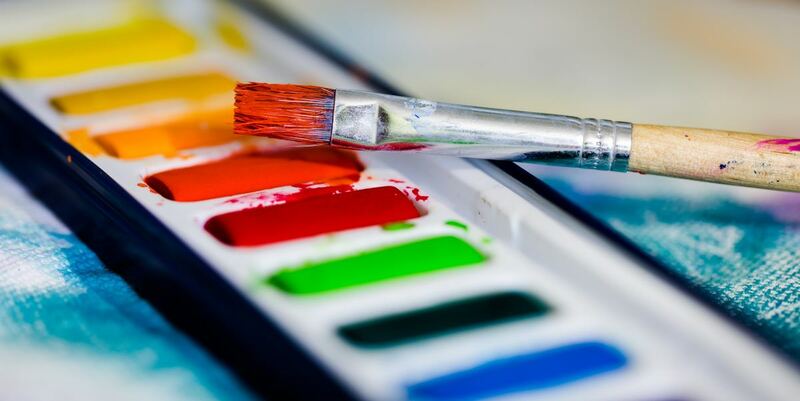 As you can imagine, the artist quality paints are better quality and more concentrated, but a higher price tag accompanies these characteristics. 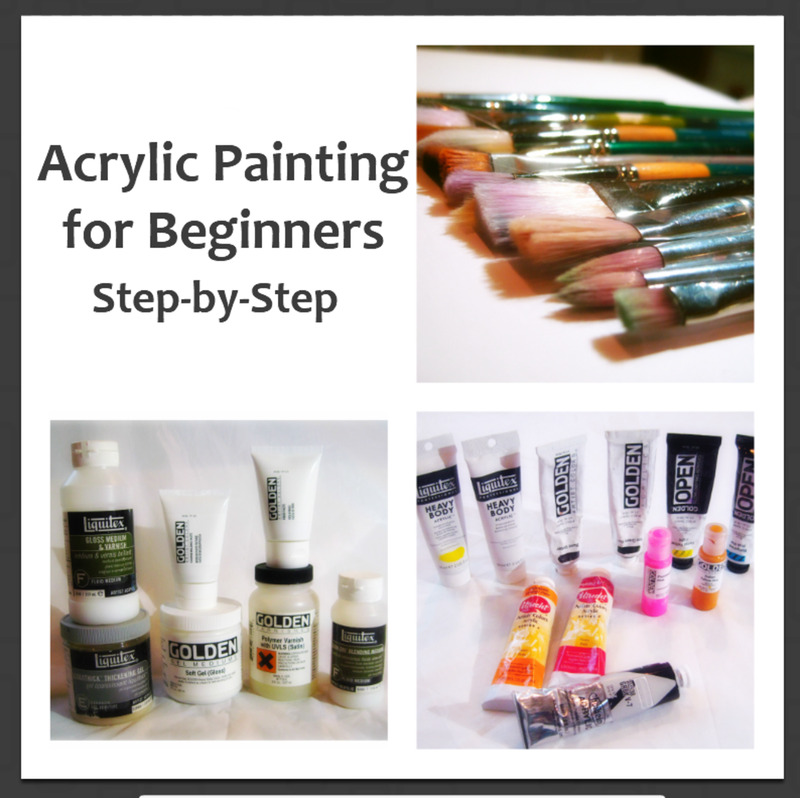 Student quality paints are lower quality, but they are more affordable and can be great for beginners who want to learn how to use paints without the fear of wasting money. Method of Use: While the paint quality differs depending on different factors, it's also important to consider what you plan to do with your artistic venture. Are you going to mainly stay at home and paint scenes from your garden? If so, choosing to use paint tubes is a very viable option for you. 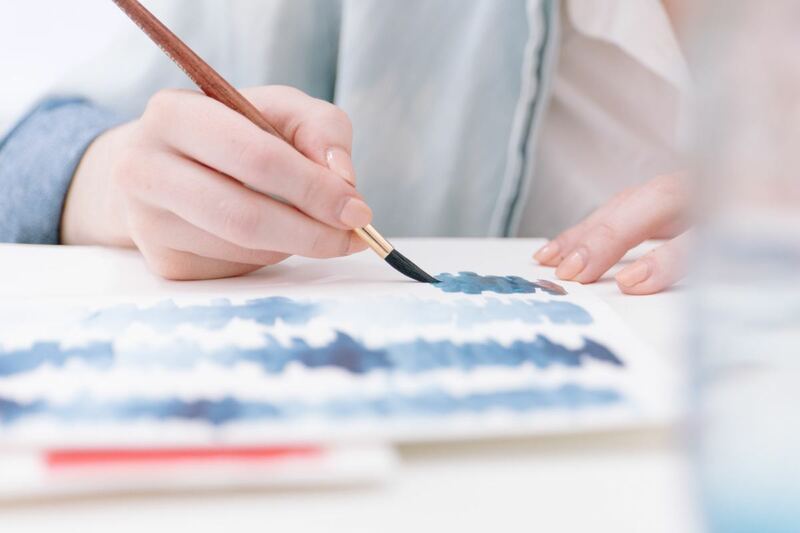 Are you planning to use your watercolors while on the train or during your travels? If so, you need to consider the portability of paint, and selecting a paint pan may be the wiser option. Brand Options: No paint brand is perfect, so again, the one you choose to get paints from are up to you. Tip: Fold up a cloth or some white paper towels and keep them near your palette to blot excess water or paint off your brush. Start with eight to ten basic watercolors. I like Windsor Newton tubes, professional grade. 2. How Do I Use My Watercolor Supplies? Before starting your first painting, it is important to become familiar with the way your paints, bushes, and paper work together. Practicing a few different methods will help you when you are aiming for different textures, smooth blending of colors, or a gradient of one color. 1. Set up your palette. If you are using a plate, just squeeze a few colors on the edge. Space them far enough apart so they don't run together. If you have a palette with wells, you can squeeze each of your colors into individual wells. 2. Test the dilution of color. With a wet brush, pick up some of the paint and swirl it around in the center of your palette. 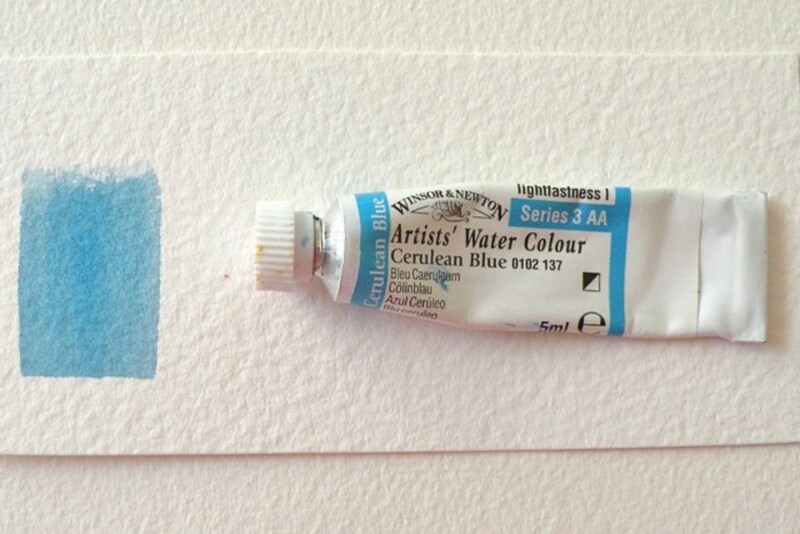 Add more water to your brush if the color doesn't move around freely. Stroke a few strokes of paint onto a practice piece of paper and try spreading it out to produce a gradient that goes from darker to lighter. 3. Experiment with different brush strokes. Try some broad, flat strokes with your flat wash brush. 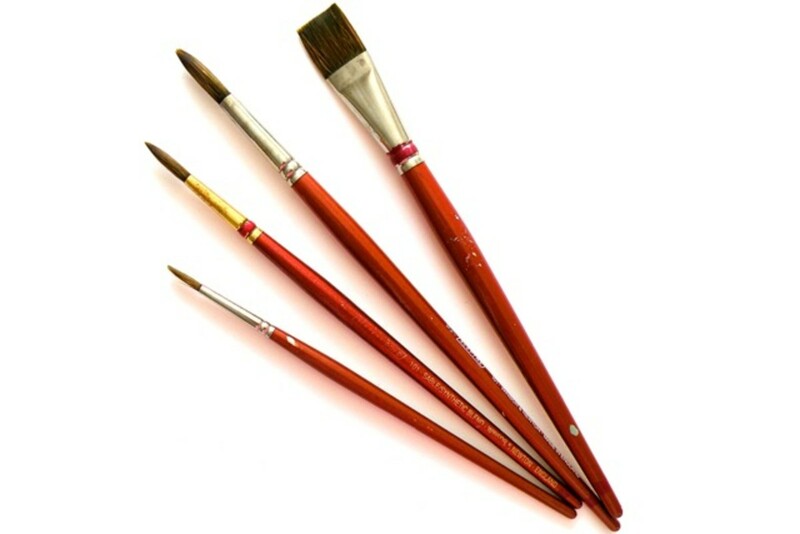 Try dipping one of your round brushes in water and turning it to make a fine tip. Pick up some paint and draw some fine lines. 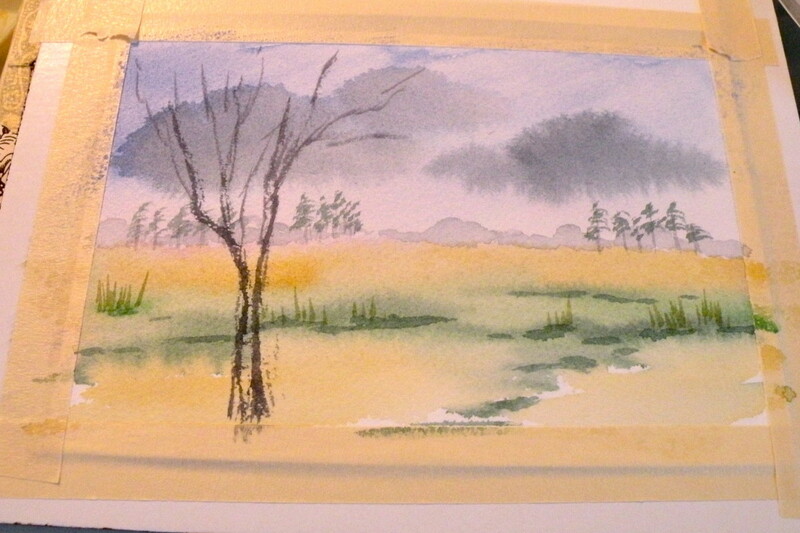 With the same brush, pick up some color on the flat edge of the brush and use just the edge to create lines or grasses. Load a round brush with more paint and use it on its side to create a texture that skips across the paper. 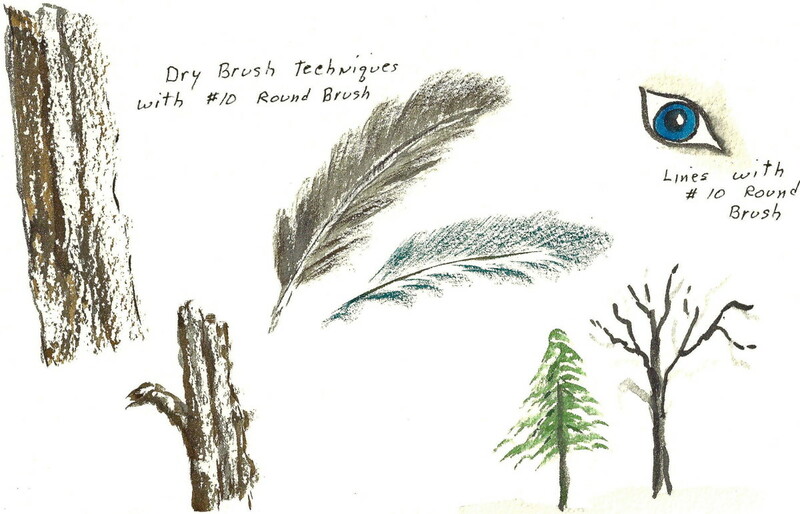 Pick up a bit of paint on the tip of a round brush, spread the bristles flat, and try dry brushing on dry paper for a feathery look. A good quality round brush will form a point if it is rolled slightly as it is loaded with paint. Use a light touch to paint fine straight or curved lines with the pointed tip of your round brush. 3. What Techniques Do I Need to Know? 1. Broad, flat strokes for large, smooth areas. Use your 1" wash brush to mix a color with some water and make a puddle of paint on your palette. Pick up the color with your dampened brush and brush a smooth area with the color. 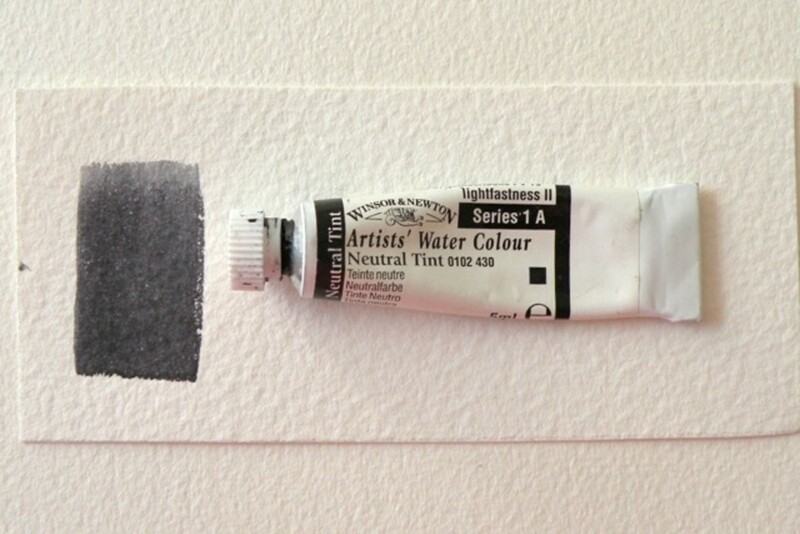 A monochrome gradient is painted by using strong color at first and then adding water to thin and lighten the color. 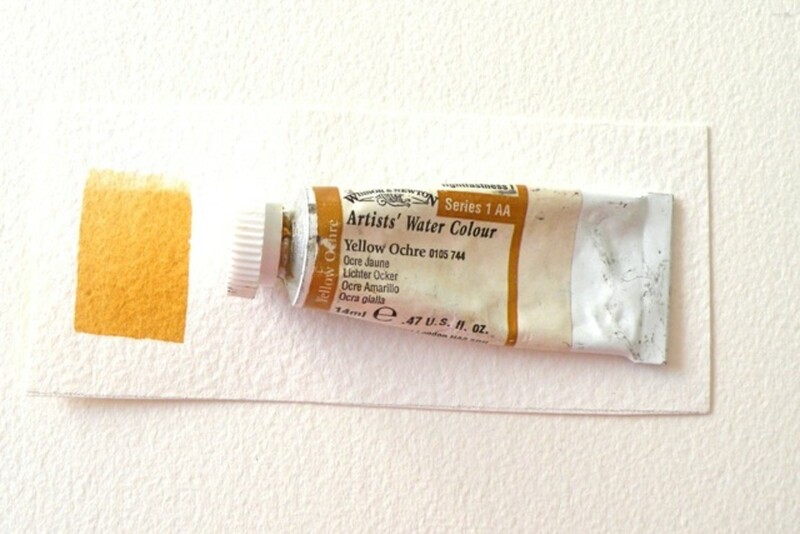 Since you do not add white to watercolors, you will get light colors by applying a thinner application of the same color. 3. Use the edge of a flat brush for sharp lines. Make sharp, dark lines with the edge of a 3/4" flat brush. This technique is excellent for grasses or deep, straight shadows. Load the edge of your brush with color and practice using the edge of the brush to make deep lines. 4. Paint textures with a dry brush technique. Painting with a fairly dry brush on dry paper is a great way to create rough textures. Heavily load a damp #10 round brush with a dark color. Use the brush on its side and pull it up along a tree trunk or a barn board. The paint will skip slightly, giving some very dark texture while leaving white highlights. 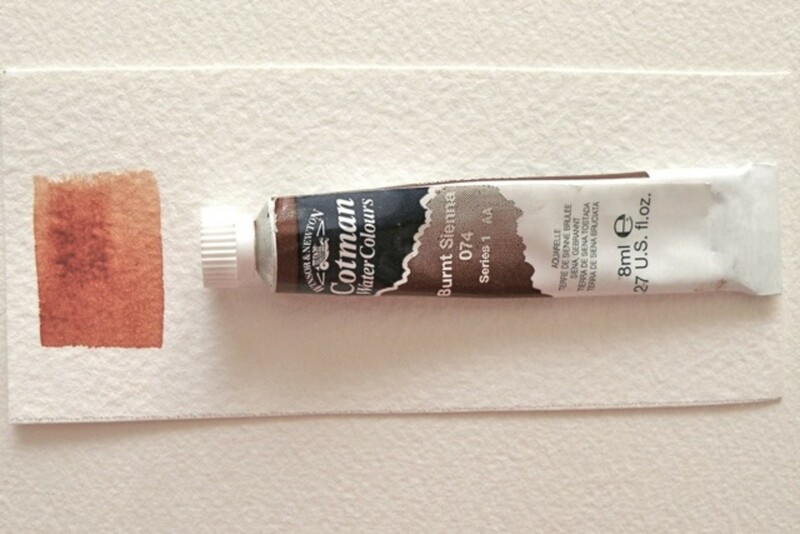 Since you do not add white to watercolors, get light colors by applying a thinner application of the same color. Painting on dry paper is a good way to get intense colors, detail, and texture in your work. As long as your brush does not have too much water on it, the paint will stay where you put it. You can use very tiny brushes to add fine detail or larger ones to create texture in wood or trees. Combining dry brush techniques with rough paper will leave white areas in the painting that sparkle with light. Hint: If you intend to paint a soft background behind a building or tree with a lot of texture, be sure to do that first with a wet-on-wet technique. Your background should be perfectly dry before starting on the textured areas—otherwise, they will run. 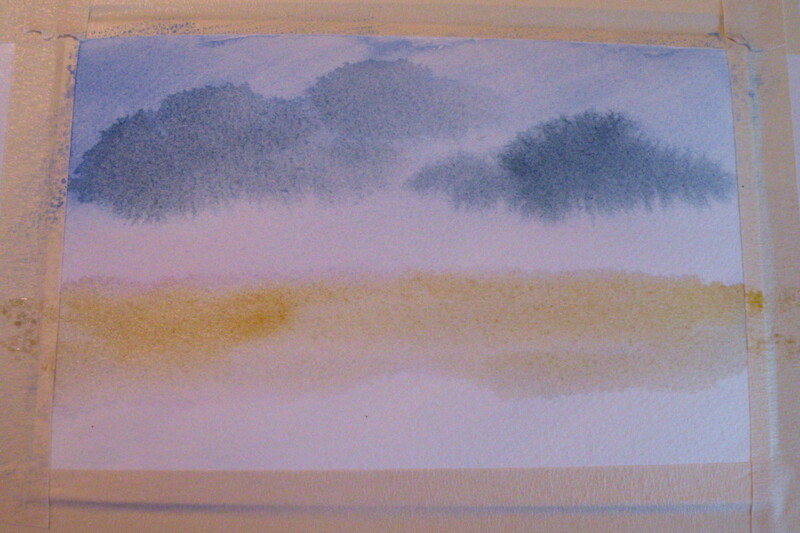 Use your 1" flat brush to wet a 6 inch square of paper. If the paper is too wet, blot gently with a paper towel to pick up excess water. 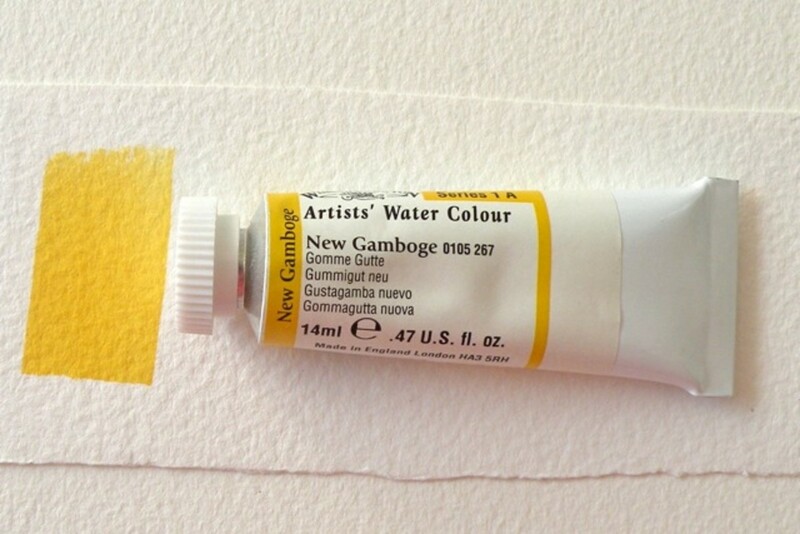 With the same brush, mix some gamboge yellow with water and apply to the top one third of the area. In the middle third, paint a fairly wet strip of sap green. On the bottom third, paint a strip of Payne's gray. Pick up the paper and tilt it slightly to let the colors blend into each other. 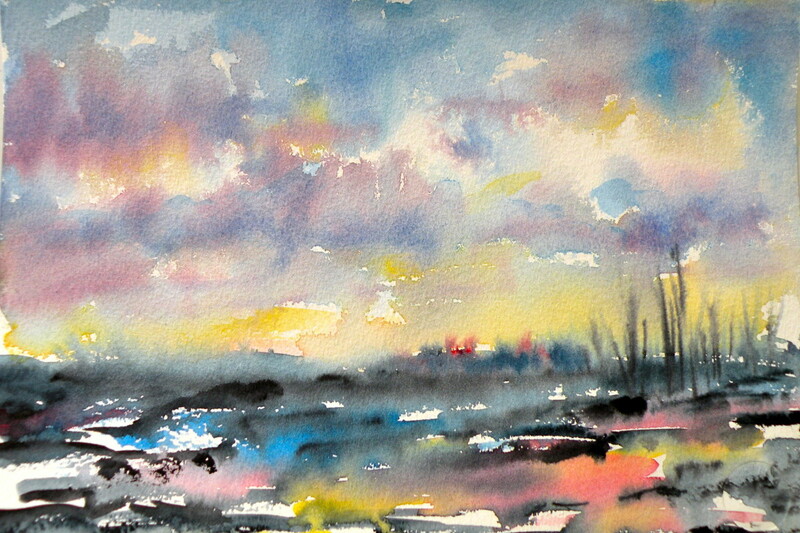 Painting on wet paper can give backgrounds and skies a delicate blend of colors that flow into each other. This is why wet-on-wet painting is a good technique for landscape. With a little practice, you can learn to put just the right amount of water on your paper to achieve the look you want. Unless you are using a watercolor block, tape your paper to a flat board. 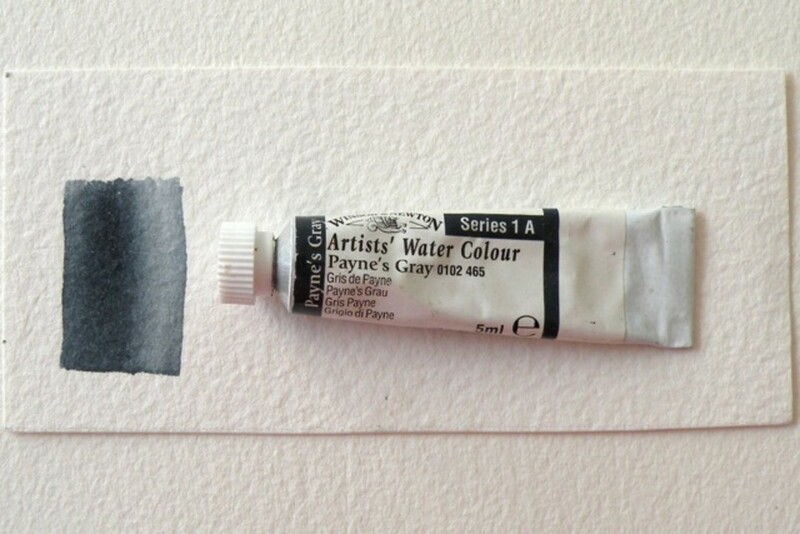 Use a large, flat wash brush to wash the whole paper with water. Spread it so the paper is wet, but make sure there aren't any puddles. Choose a sky color. 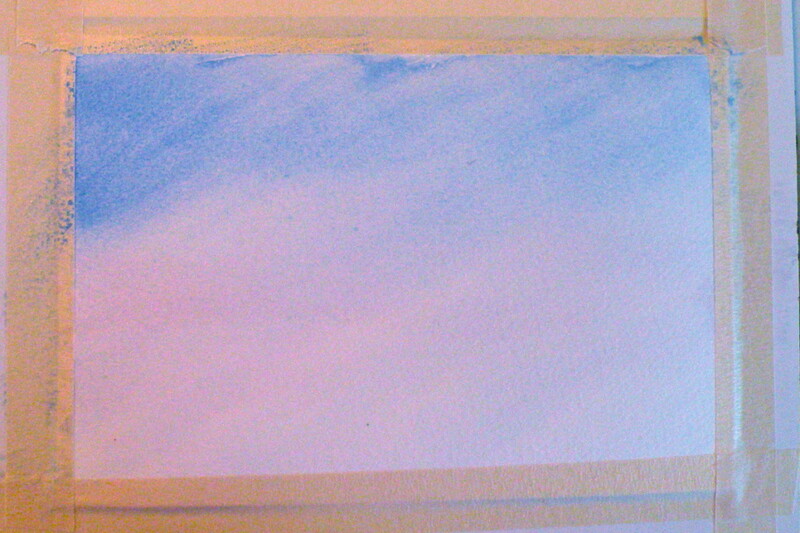 For this exercise, I used cobalt blue. With a 1" flat brush, paint a smooth coat in the sky, darker at the top of the paper and lightening it up as you get to the horizon line. 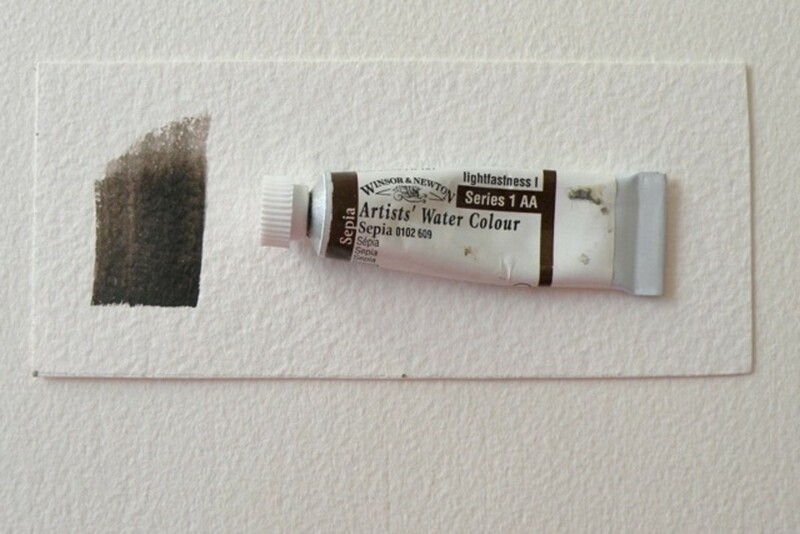 Dip your dampened brush into a neutral tint or Payne's gray. Add a few cloudy areas. 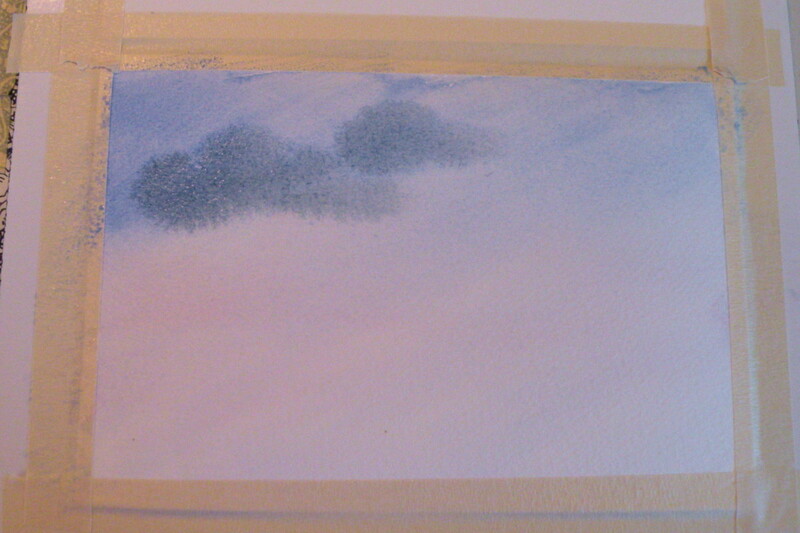 If your paper is still fairly damp, the gray will blend into the blue while still keeping the cloudy shapes. Don't overwork the sky or clouds. 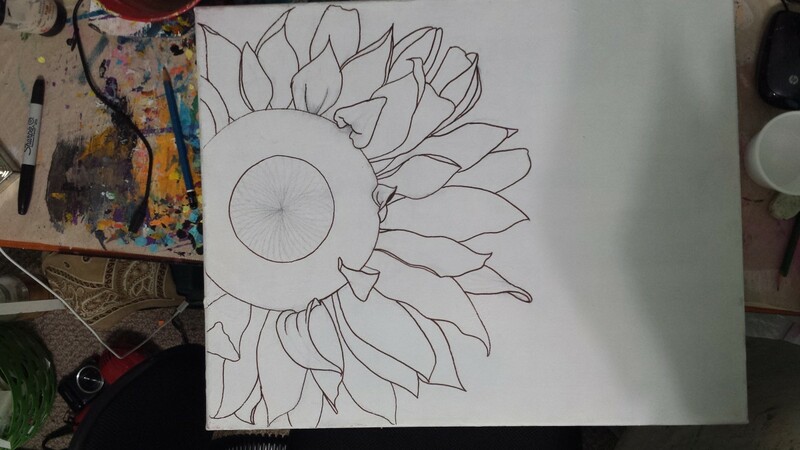 Once the color is on the paper, let the colors flow into one another for a natural, soft look. 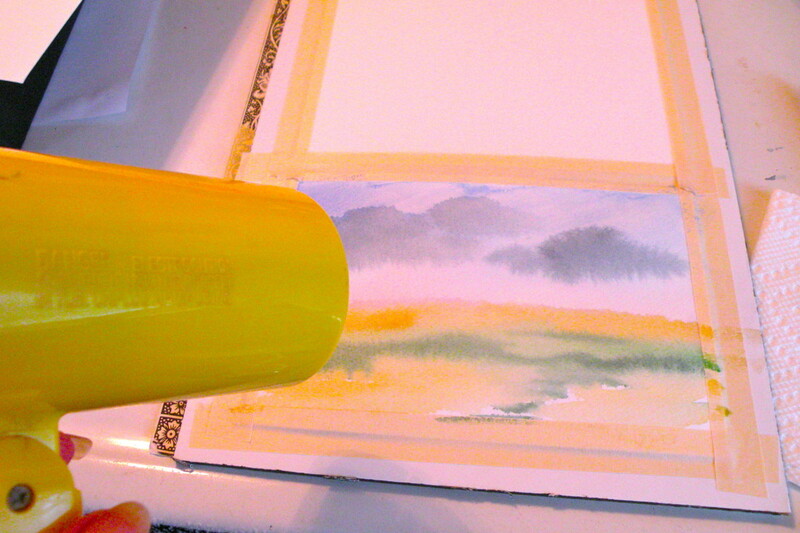 Let background dry naturally or quicken the process with a hair dryer before moving on. 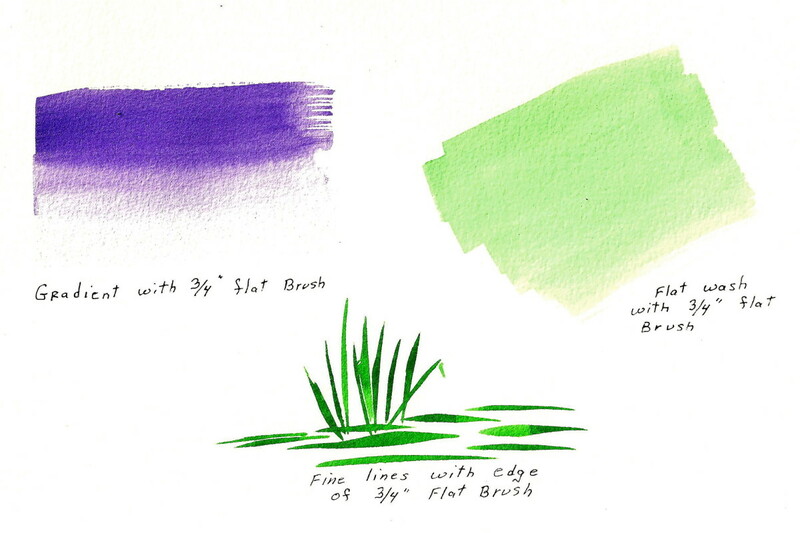 Use the edge of your flat brush to pull out some grasses from the deeper green areas. Add a few clusters of tree trunks along the horizon. 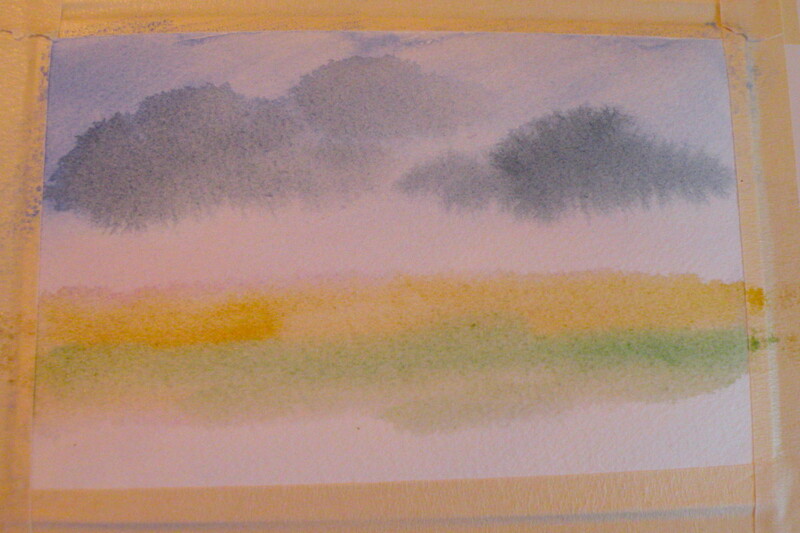 Then, paint in some foliage on the distant trees. Deepen the green shadows. Using a natural tint on a round brush that is fairly heavy and dry, roughly paint in a tree trunk and some branches. If you wish to paint some foliage on the tree, wet irregular areas where the leaves will go and drop in some bits of yellow ocher in the branches and on the ground. 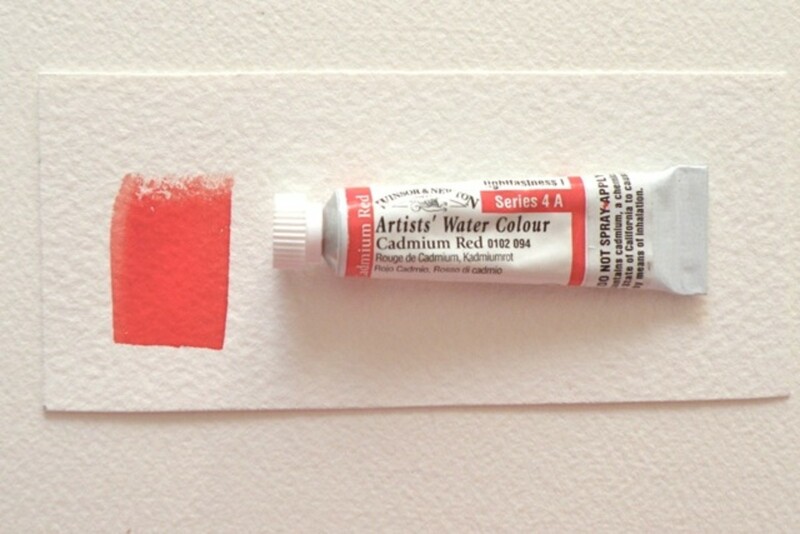 While the paper and color are still wet, add some areas of cadmium red and sap green. The colors should flow together slightly. 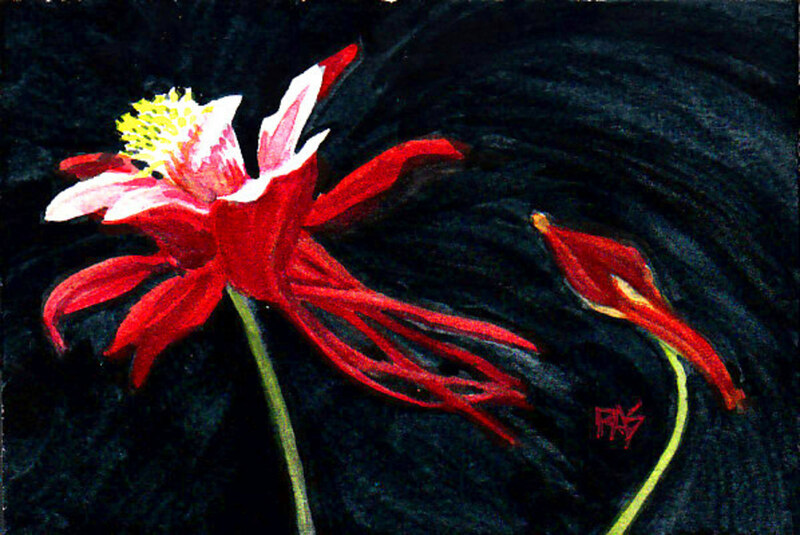 Watercolor pencils are an art medium that combines drawing and painting. They look like normal colored pencils, but the watercolor effect is created when you add water to the drawing. An advantage of using these pencils is the ability to create very fine details that would be much more difficult by using a brush. Sketch out the drawing you want to create. Add watercolor pencil details wherever you want the paint detail. Slowly build up the layers and add water to them so that you can control the intensity of the colors. 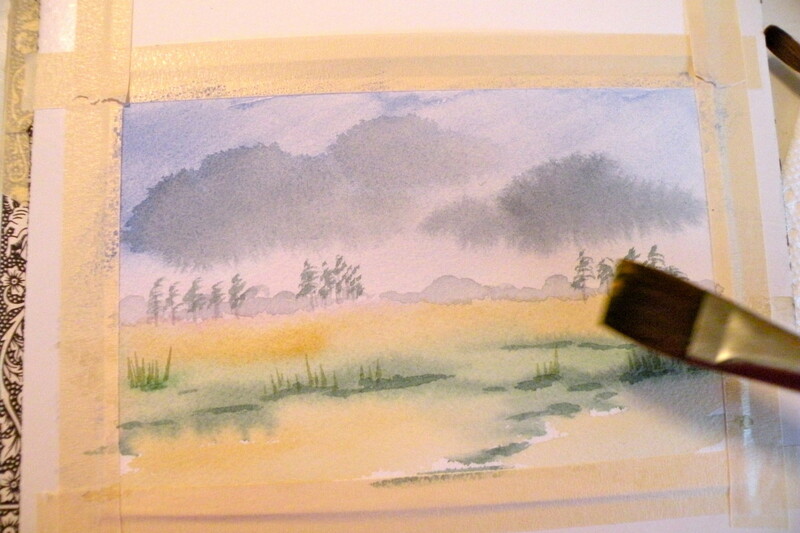 Use a water-dipped brush to dissolve the pigments left by the pencil. Try experimenting by using the watercolor pencil to add details to a wet surface. It will still work fine, and you can see what effects can be created by trying it at different wet factors. Make sure to use a thick paper, preferably watercolor paper, for these pencils. As you add more water, thinner papers will buckle strangely and distort the painting. If you want to use the pencils on a smoother surface, I suggest using illustration boards because they can handle the water but are a lot smoother than watercolor paper. Start Painting and Have Fun! 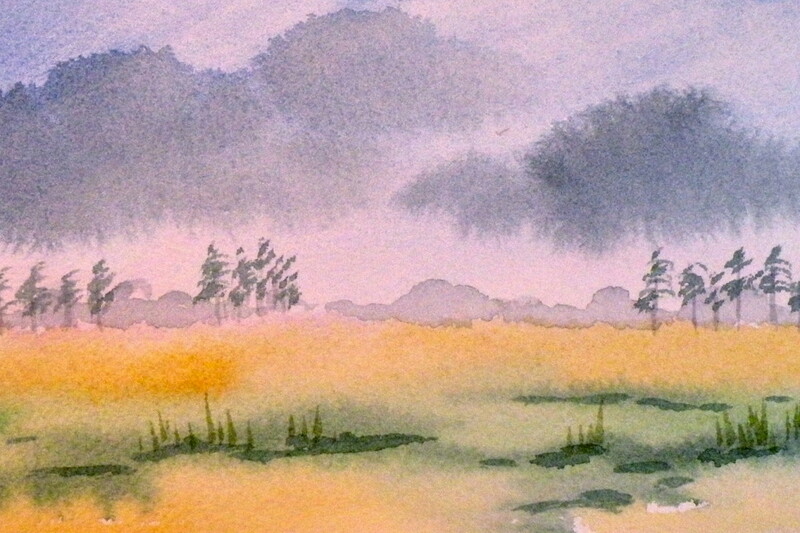 When you feel comfortable with your supplies, try painting simple subjects or landscapes. The painting does not have to be perfect. Keep experimenting and enjoy the creative process! Should paper be stretched before using for watercolor to avoid rippling when dry? If so, how should I do it? I don't normally stretch my paper because I like using a block, like Arches, which keeps the paper flat. 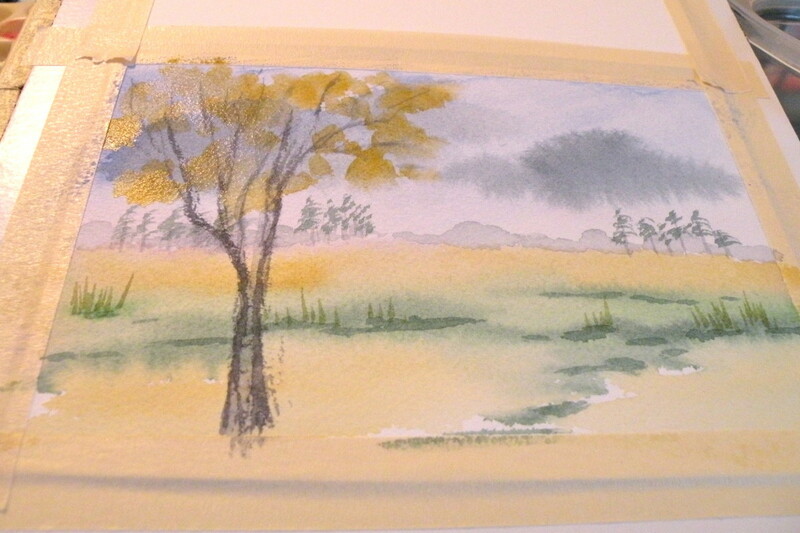 I do like to spray or brush the paper with water before applying my background. Artists who use loose sheets of paper might want to stretch their paper. Some like to soak it in a tub of water and then tape or staple it down to a board to dry. Be gentle when handling the wet paper to avoid tearing. Other painters will tape the paper down and soak with a spray bottle of water, then let it dry. When I was a total beginner and didn't want to invest in really expensive watercolor paper such as Arches, I used a lighter and less expensive brand. I taped it down on plywood using a good painter's tape, wetted it with a just water and a brush painting both horizontally as well as vertically and then put a piece of clear plastic on top and weighted it all down. I let it dry and then began painting. This process resolved the problem of buckling. Grettings, Stephanie. I am 74 and want to learn watercolor painting. I found your artical to be very helpful. I have never visited this site, but decided to check it out. I was amazed at your life adventures and interests and just plain ole IMPRESSED! I hope you are well and that your life is blessed. Thank you for this helpful article. About to restart watercolour painting after 50 years, I found your page inspiring. Sue Simpson. Thanks, Stephanie. This was a great tutorial. I learned how to use my brushes for different effects which was one of my major problems. 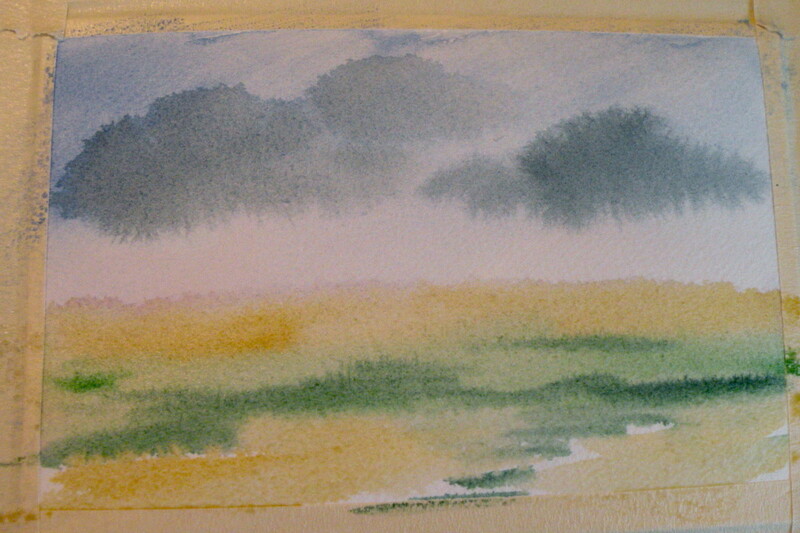 I have been taking a watercolor class for about 2 months now just one day a week. I have a great instructor but can't spend as much time with her as I want to so it really helps to have these at home tutorials to help us amateurs out. I'm glad you found this to be helpful, Heather. Enjoy your painting! Fantastic, I now know more about what I am doing and what I should be doing to practice my painting. Will keep reading your site to learn more. Love your site it really helped me learn more about brushes. Can not wait to try. Thank You Very Much for such helpful tips.. Feeling comfortable trying my hands on it now. 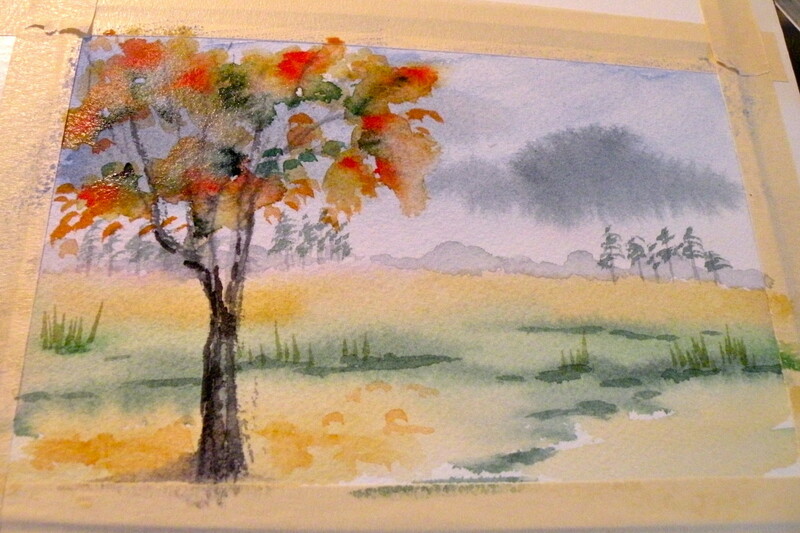 Hi Peggy, I think that the secret to good watercolor painting is to use the best paper and keep on practicing! Hope you enjoy giving it a try some day! 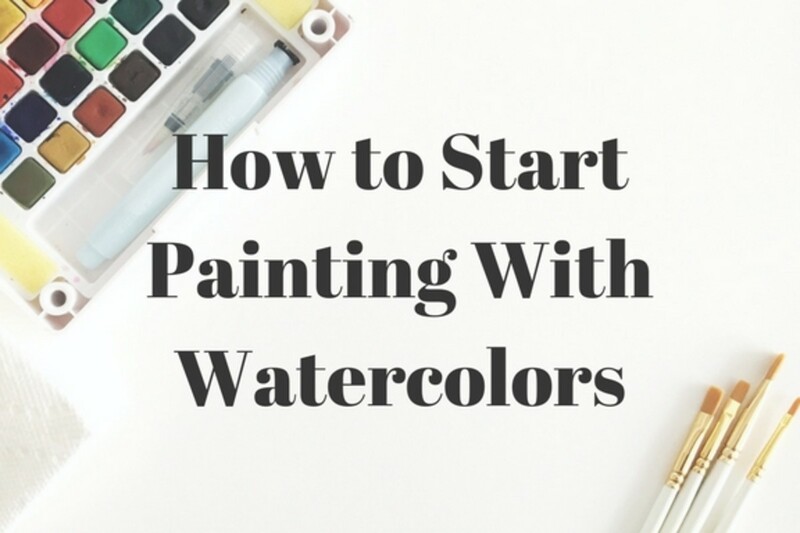 You make it sound relatively simple to paint with watercolors. I really liked the bark effect you demonstrated. Perhaps I will give it a try one of these days! Pinning this to my Do You Know This? board. Thanks for this hub! I love watercolor painting. Glad to find some good advice here! This is such an excellent and well written piece. I keep saying that I am going to get out the paints and have another go at it. Good points Stephanie. I would love to give it a try if I'm in the mood to watercolor paint. 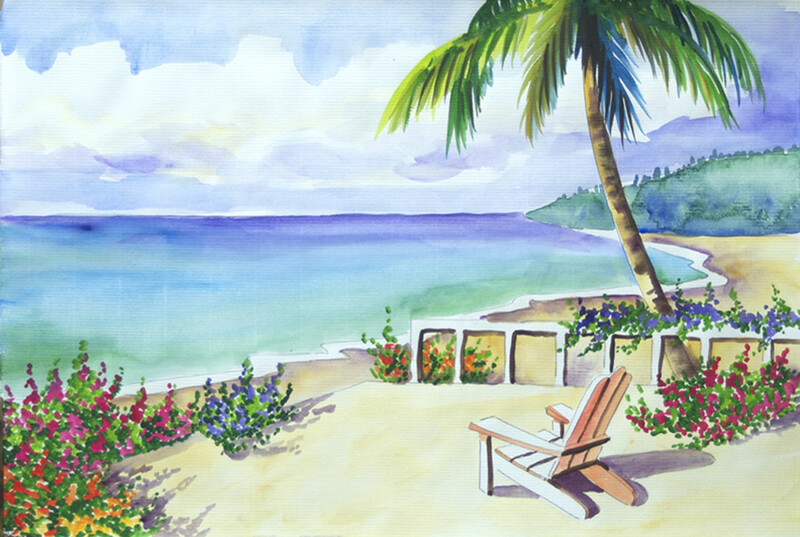 Kristen Howe - I love watercolor painting because it can easily be set up in a small space. Because it dries quickly, it is very portable, too. Yes, I do find it therapeutic...hope you do too! 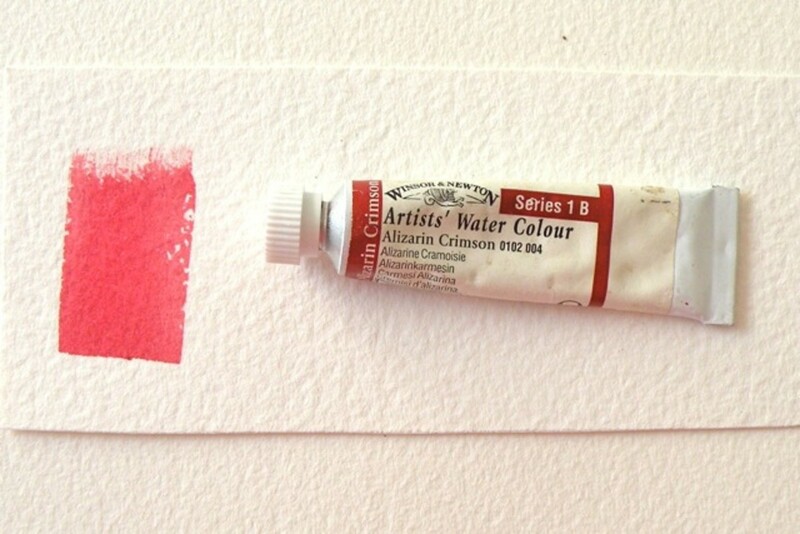 Great tips on how to start painting with watercolors. It can be very therapeutic too. Voted up for useful! The Dirt Farmer - Thanks so much stopping in to read my hub. I'm glad you enjoyed it, and I appreciate your comment! What a perfect primer for the novice! Thanks so much for sharing your work. Awesome! Leatrice - I'm pleased that you found this article useful. Much luck with your water color painting! I am so happy to find your site.I really want to try water color painting. Your instructions look simple for a beginner can't wait to start. I am impressed on how you outlined this for people like me to read. 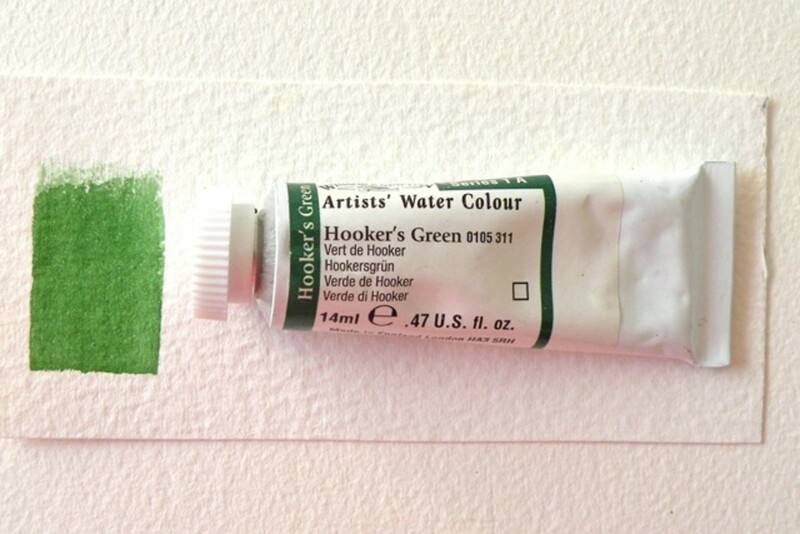 I never new water color paint came in tubes. I only thought they came in those little plates with the circles. I would really, really like to give this type of painting a try sometime. For now, I will admire your work. Thanks for writing this!!! I am sharing this!!! Dbro - These instructions are really basic, but I hope will be helpful to the very beginner. I appreciate your taking time to read and comment on this from an experienced painter's point of view. I've enjoyed many of your articles on art! Thanks for stopping by. I really enjoyed this hub! I'm a watercolorist too. I really appreciate the way you gave great instruction in easy to understand terms. I also appreciate that these instructions did not seem in the least intimidating. I think many people would draw and paint if they weren't afraid of failure. It seems we have both learned the only failure in art is failure to try! Denise - Good for you! I'd love to see your paintings once you get started. Too bad we don't live a little closer to each other...it would be so much fun to paint together! pstraubie48 - I do hope that my instructions give you the confidence to give water color painting another try - it is worth the effort! Good brushes do make the painting a little easier,but some people seem to be able to paint well with any kind of brush... Thanks so much for stopping in to comment! This is a great way for me to make the plunge. I have shamelessly watched Bob Ross and his instructions on painting man times. He makes it seem so easy but when I pick up a brush, alas, no such beauty emerges from the end of my brush. Maybe it is not the bursh's fault??? 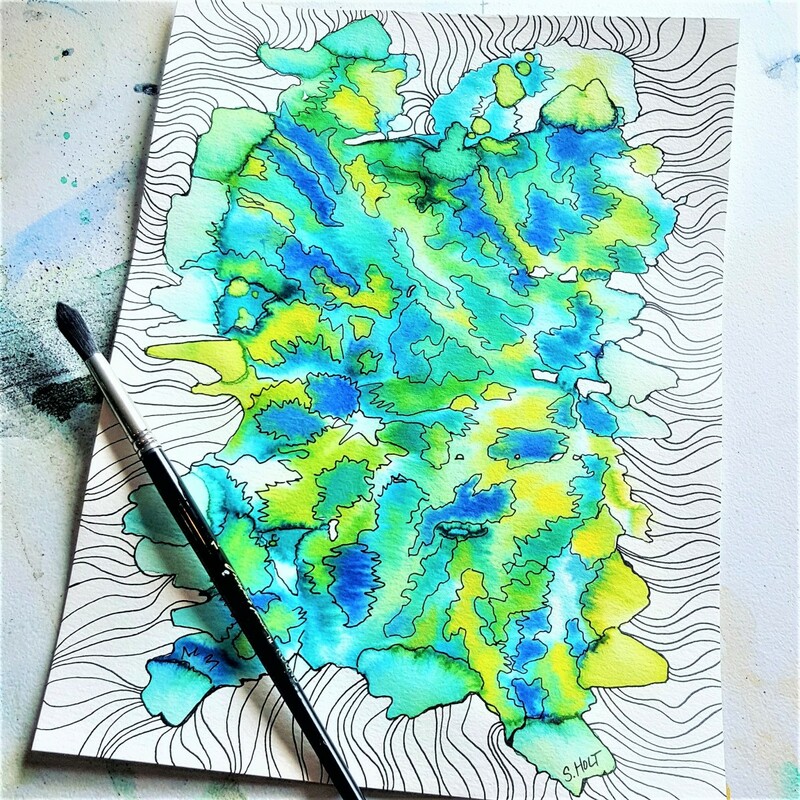 Randomcreative - Thanks so much for checking out and commenting on my hub on beginning watercolor painting! Thanks for this detailed, comprehensive resource! Your work is beautiful. Glimmer Twin FanT - Sometimes we are trying so hard to accomplish a finished piece that it takes the fun out of it. I find that playing some favorite music and just dabbling paints and water on scrap paper is a good way to loosen up, but a lot depends on your style of painting. Each one of us is different and expects something different from our art. Glad you liked the tutorial. Perhaps you'll give watercolor painting a try again someday. Thanks for stopping in to comment! Years ago I did a little watercoloring, but I just couldn't master it. I don't think I can relax when I paint. This is a great tutorial. RTalloni - I'm so glad you found this guide to beginning watercolor painting useful. Perhaps one day you'll give it a try. Thanks so much for stopping in to read and comment! Thanks for this guide for getting started with watercolor. This is an area I have not yet ventured into, but I find this practical and encouraging. Kashmir56 - I'm so glad you enjoyed my hub on beginning watercolor painting! It was fun to do, and I hope that it will inspire some people who have been wanting to give it a try to get out their paints and brushes. Thanks so much for visiting and for our comments! Great hub very beautifully done and explained . Can't wait to see more of your beautiful paintings. Keep up the good work ! 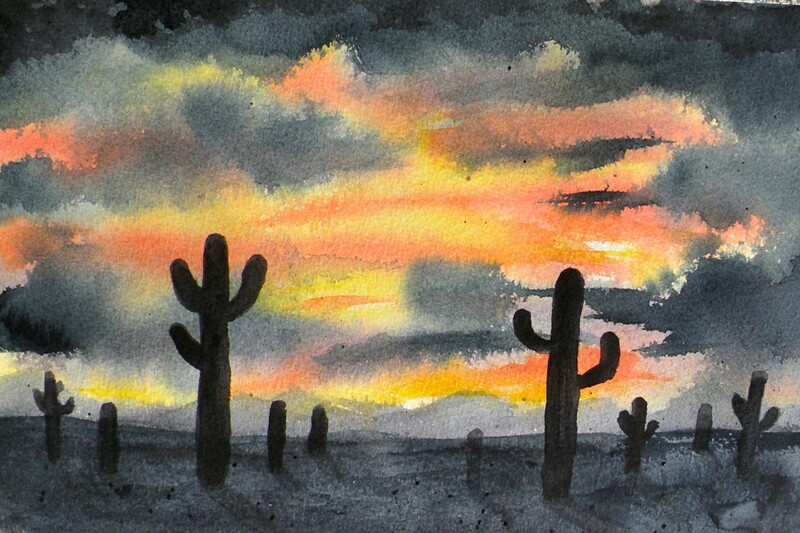 jools99 - I'm glad you liked my desert sunset watercolor. My next hub gives instructions on how to paint one yourself! :) Thanks so much for stopping by and for your nice comments! Austinstar - I also love the bright colors of acrylics, but have found that I can achieve more softer, more delicate paintings with watercolor. I think that some artists do very vibrant watercolors...it's a matter of style. Well, if you love the desert painting, I'm sure you can do one that is similar! :) Thanks for stopping in to comment! Happyboomernurse - I am hoping to do additional tutorials for beginning watercolor painting, and have a few projects in mind. This is my first (baby steps!). Thanks so much for stopping in to comment and vote! Although I do love the stark, bright colors of acrylics on canvas, I can also appreciate the beautiful hues and blends of water colors. This is a great little tutorial on how to get started. Wow! What a great tutorial on learning how to paint with watercolors and how exciting that it looks like you're turning it into a series. Blond Logic - It's amazing what hidden talents we have that are just waiting to be discovered, and I'm so glad that you will give watercolor painting a try. Happy Painting! Rosemary50 - Sometimes we just need a little inspiration to get started in a favorite hobby again. I'm so glad that you've decided to have another go at watercolor painting and hope you e another aspect of enjoy unleashing another aspect of your creativity! Thanks so much for the read, comments and the share! I always thought that art just wasn't my forte. This is just what I needed to get me started. You have explained it so even a beginner can understand it. This is a really excellent lesson! It is tempting to try with all this to come back to. Thank you. Sharing! Voted up. Will have to come back to share, there is no share button! Guess it is a new Hp deal...sorry. Billybuc - You have so many other talents! Thanks for your support - I always love to have you visit and comment! Steph, I am here for support. I can't draw a stick man without it looking like an outhouse! However, you draw very well, and I enjoyed the tutorial....nice job! Sunshine - You do make me smile! No reason you can't paint whenever the spirit moves you. If you've never tried it before, you may surprise yourself! Thanks for your comment!